Above: The copy I am reviewing has a cover as in the upper left. The one I read as a teen is upper right. 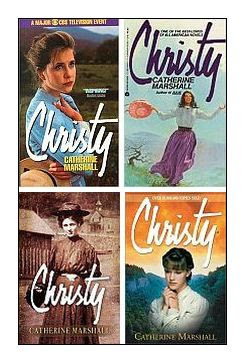 The lower left is the Kindle edition cover using a photo of the real Christy, (Leonora Whitaker), and lower right is another version of many covers that have been published in the last 50 years. Christy is still going strong. 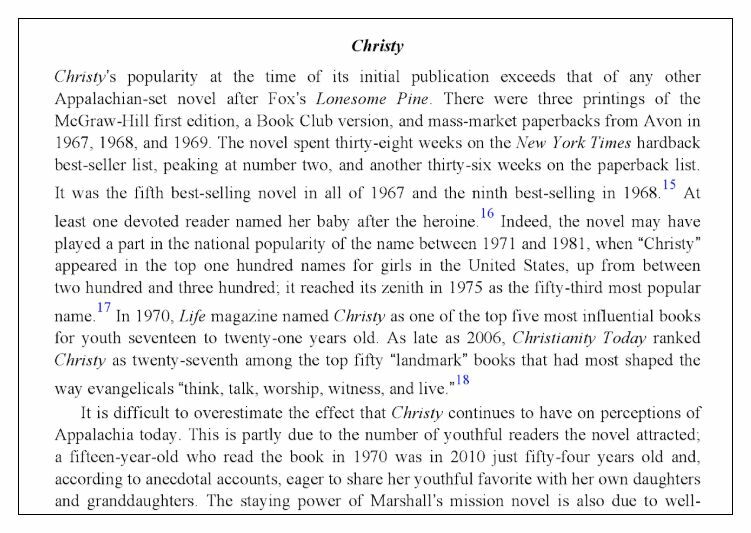 Christy (1967) is a historical fiction Christian novel by American author Catherine Marshall, set in the fictional Appalachian village of Cutter Gap, Tennessee, in 1912. The novel was inspired by the work of Marshall's mother, Leonora Whitaker, who taught impoverished children in the Appalachian region when she was a young, single woman. The novel explores faith, and mountain traditions such as moonshining, folk beliefs, and folk medicine. 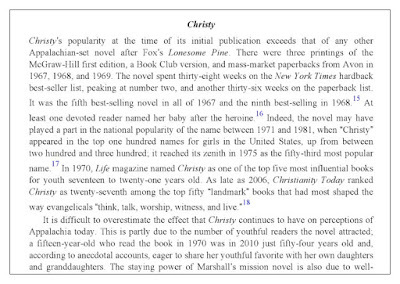 Christianity Today ranked Christy as 27th on a list of the 50 books (post-World War II) that had most shaped evangelicals' minds, after surveying "dozens of evangelical leaders" for their nominations. The book is listed as historical fiction, but the author Catherine Marshall said she drew heavily on her mother's life for the actual events recorded in the book. For the events that did not occur in Mrs Whitaker's life AKA Christy, such as the typhoid epidemic, the author researched diligently to present a historically accurate event that was true to the times and the place. I love a teacher story so even though the book deals with many theological themes, I read it as an unsaved teenager for the teaching part, and enjoyed it fabulously. I got a notion a few years ago to revisit the book now that I am saved, in order to enjoy the theological parts as well. When I came across it at a Library Book Sale, I delightedly bought it. On GoodReads, Christy has an average rating of 4.21 collected from 43,635 Ratings. There are 1,494 Reviews. Most of the reviews are 4 or 5 star. Wow. On Amazon there are 76 ratings & reviews, and all of them are 5 or 4-star except for two ratings that reported a Kindle glitch. Though thousands of people have given the book highest ratings, I must sadly depart from the crowd. I have three minds about the book Christy. 1. As a secular story, it is an extremely well-written, absorbing (500-page) book that would capture any reader for the vivid descriptions of the majestic mountain locations and the well-drawn characters. The history alone and deep knowledge of lives lived in a long-ago time is enough to recommend the book. It definitely makes an impression from the first page. 2. As a faith story aimed at many Christian women, it stands alone in stark contrast to many books of its genre published today, in a good way. Modern faith stories have trivialized today's woman in her struggles with a chosen career, uncertainty of effectiveness in missionary work, her doubts about what she believes, romance, mentoring, friendships, and more. Today's faith stories usually include the silly main character (usually an antiques dealer or a florist) encountering a short-lived, superficial bump in the road made out to be a monumental struggle, a passing glance at some trite beliefs, and finishing with a direct whisper from God telling the girl to go marry Joe, and they lived happily ever after. Christy, on the other hand, delves into strong rapids swirling with rejection, fear, uncertainty, God's plan, romance, death, marriage, and love for neighbor under adverse circumstances. It has guts. It has grit. To that end, it's a true mission story. 3. As a faith story, it is a theological train wreck. I can't recommend it at all based on the number of false theologies it introduces. There's mysticism, Quakerism, direct revelation, biblical errancy, social justice, moralism, and more. Though there is mention of Jesus, more often the author chooses to use a generic name such as the "Authority", or simply "Someone." Someone? I was reminded of the verse in Acts 17:23, the monument "To An Unknown God". Though the characters wrestle with evil, a lot, sin is never ever discussed. The main character is shocked by the level of superstition and darkness in the people to whom she is ministering, but the solution of the Gospel is never raised. They just try harder to get the people to be moral and to love well. God's sovereignty is not presented, but man's free will is. The long version is that the book is not "just fiction." The novel presents itself as a theological faith story, and as such, it's incumbent on us to review that faith and compare to the Bible. Here are the nuts and bolts. The copy from which I'm quoting is Mass Market Paperback from Publisher Avon, published June 2006. On page 103, Christy seeks advice from her mentor, a Quaker woman named Alice. Now, please understand, that Quakerism, or as it used to be known, quietism, "does not reflect a biblical approach to spiritual life," as John MacArthur is quoted. Much is made of Alice's quiet spirit, her centered approach, her great still pools of eyes that looked piercingly at you and spoke of the 'inner Light". Matt Slick writes of the Quaker beliefs and practices, that they believe in general (though there are many different manifestations of people populating the Friends' Society) that the Bible is a guide but subordinate to direct revelation, they do not practice communion nor baptism, women can and are leaders and elders, (on Page 332 the pastor in the book deferred to Alice the Quaker to preach a funeral to the gathered community), salvation can be lost, and there is no such thing as total depravity. Never mind the complicated justification explanations. There is not talk of repentance since sin is downplayed. As a matter of fact, they believe sinless perfection can be achieved in the flesh. Many of these threads are overtly or subtly brought out in Christy. In the book, on page 308, Alice teaches Christy that not only spiritual blessings but material blessings can be gained if we just "claim them." This is a strange conversation to be having when the poverty around them was so dire that the unsanitary and impoverished conditions of a cabin she was visiting and its inhabitants made her vomit. Just 'claim riches'? For shame, Miss Alice. A few sentences later, Alice explains the problem is evil exists and not to compromise with it. She said we must fight it. How? "Listen for His orders on strategy against evil..." She did not instruct Christy to seek that advice from His word. Subtly, the Quaker character steers Christy away from specifics of the Bible, mentioning the Bible a lot but not consulting it as the Word of God filled with Holy Spirit life and solutions to today's issues. Given today's young women who already have a tendency to listen for direct whispers and heavenly advice, the subtle dismissal of God's word as authoritative and final is troubling and I would not put this book in front of young women for that reason alone. Love is the key for Quaker Alice, and for the book's characters in general. Not repentance. Yes, love is important. However the character teaches that we can have Jesus' friendship "only if we are willing to let go our resentments and our hating and our feuding and our our name-calling and our shooting and love one another." [emphasis theirs]. In essence, our works (loving well) brings Jesus to us, which is consistent with Quaker theology. The closest the character got to the Gospel in her sermon was to say to "trust our Friend, and He will root out bitterness and replace it with love." We need more than trust, but to repent and believe. (Mark 1:15). These theologies were evident in the book, spoken through this main character Miss Alice. This is what "Alice" was teaching "Christy" and thus, the reader. The pastor in the story was a man who was not settled in his beliefs. He didn't seem to be saved at all, as a matter of fact. In the end he seemed to give up the pastorate completely. He wrestled with many theological problems, and not the hard ones, either. He did not believe in biblical inerrancy, taught that the soul goes to sleep after death, wasn't sure about our resurrection after death, (but humans are probably immortal because the flowers come back every spring, don't they?) didn't believe in Jesus' miracles because they very likely have a natural explanation, and how one lives is more important than what one believes. "Dogma isn't important. It's the results in the community that count. As for the Bible, it's an amazing book, the best book of wisdom that we have." Pragmatism at its best. These theologies were evident in the book, spoken through this main character. This is what "David" was teaching "Christy" and thus, the reader. The missionaries wrestle with the problems of poverty and illiteracy and seek to solve them in human terms and works. On page 405, Christy is ruminating on the ideal (religion) versus the practical (everyday needs). She never sees the connection between the so-called "dogma" and the real life issues the people to whom they minister face. In their view, the people's physical needs always outweigh their Gospel need, and they always will, because none of the three characters see man's depravity as the root issue. Yet in fact, it's the opposite: man's spiritual need is much greater than poverty, illness, or illiteracy, as dire as they may be. Here on page 405 Christy finds the solution, which is no solution. How would believing in the love of God solve problems like illiteracy of poverty for the highlanders? Now I saw the connection between Miss Alice's certainty about the inner guiding Light and Grundtvig's ideas. God did have a master plan for the Cove, and Grundtvig was saying that we could find that plan by looking deep into the human spirit. Therein lies the rub. First, the characters try to solve the issues of the day by looking everywhere except the Bible. Second, did Christy come to the mountains to solve social ills, or to save souls? The social justice theology so prevalent at the turn of the last century was evident in the book, spoken through this main character. I'll address social justice in a separate blog essay this week. Third, do we solve societal ills by 'looking deep into our own spirit'? Or do we turn to THE Spirit and fall to our knees and ask Him to enter us as the seal of the guarantee, after repenting of our sins? We know the answer. Any place we look at in history where the Gospel took root, schools, orphanages, and hospitals sprung up, where prior to the Gospel, charity was little known. The book ended with a trip to heaven, seeing people who had passed on, and reveling in the "Light" -but no Jesus was evident. Sigh. I'll address heavenly trips in a separate blog essay this week. So, then how should we classify this novel? Or is it fictional theology? If it is fictional theology, then it is theology that has no biblical basis. That would make it heresy by definition. So, one can’t claim that it is fictional theology and still defend it as a basis for personal spiritual growth, comfort and encouragement. But what about theological fiction? If it is theological fiction, then wouldn’t it have something of a parallel in the genre of historical fiction? How does historical fiction work? In general, it uses (and must use) true historical events as a framework for the book. For example, no historical novel could ever put the attack on Pearl Harbor in 1950. If it did, then such a book would be relegated to "fictional history" – and no one would take it seriously from an historical perspective. However, many people do take The Shack very seriously. And those who do take it seriously now view God differently than they did before. In other words, their theology has changed. But their new theology is not found in the Bible. And not only is this new theology not biblical, it actually contradicts the theology of the Bible. Therefore, any emotional or spiritual impact that The Shack might have is based on something other than the truth – which in other words, is a lie. Quite obviously, believers cannot base their spiritual growth on a lie. If they try to do so, something might happen, but it can’t be called "spiritual growth." I cannot overlook the absence of the Gospel in Christy, the lack of focus on sin, the silence of the need for repentance, the constant mystical direct revelation, the emphasis on inner truth derived from voices and whispers and not the Bible, and the exalting of a Quaker as the steadiest, most mature religious person in the book. 3. Let us be proud of our mountain folk and their great heritage. The Shack has already come and gone. Christy, fifty years later, has staying power. It's spawned spin off book sequels, two television series, and a TV-movie. It's still in print. In the Morgan Gap (the actual Cutter Gap) an annual ChristyFest is held. Not recommended. Leave Christy in her mountains, and seek better, more theologically sound women to spend time with, be taught by, and to be inspired by. I'd much rather read and re-read Gladys Aylward's book The Little Woman, about her years in inland China as a missionary. Elisabeth Elliot's travails in Ecuador. Corrie ten Boom's The Hiding Place. Amy Carmichael- A Chance To Die: The Life and Legacy of Amy Carmichael by Elisabeth Elliot. A Reformation Life: Katharina von Bora by Rudolf Markwald.